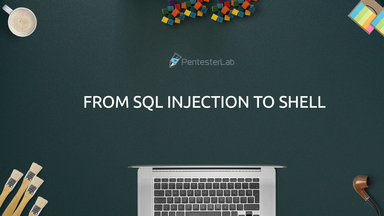 Meetup pack for "From SQL Injection to Shell"
You are helping the community, we want to help you! We put together slides for some of our exercises so you can use them to run hands-on training during security meetups! We provide you with slides and an ISO to run a hands-on meetup on one or multiple execises. First, make sure you're very familiar with exercise. We recommend to solve it at least twice. Then review the slides (https://ptl.io/s/1) and make sure you are comfortable walking people through them. Doing a dry run with 2/3 persons always helps. You cannot use our material to run a commercial event or get people to pay for your presentation. You can use this content for a free lecture, a public meetup, an internal meetup or training within your company. Tweet to @PentesterLab if you want us to help advertise your meetup. Contact meetup@pentesterlab.com to provide feedbacks or improvements (wording, typos...). Get people to download the ISO and setup the exercise before the meetup.